White blood cells are like the “assassins” of systems biology. Some destroy viruses by swallowing them whole, others lie ready to sound the alarm with inflammation, while “natural killer” white blood cells hose down infected cells with a toxin that causes immediate cell death. The human immune system is an intense, fast-paced game of cat and mouse on a cellular level, and thanks to researchers at the University of Pittsburgh, now the game can take place on a cell phone. McGowan Institute for Regenerative Medicine affiliated faculty member Jason Shoemaker, PhD, assistant professor of chemical engineering at the Swanson School of Engineering, and Robert Gregg, a PhD candidate studying intercellular immunity in Dr. Shoemaker’s group, created the game “Vir-ed”—a virtual reality (VR) education game designed to teach new biology and biochemistry students about the human immune system. In Vir-ed (which rhymes with “wired”), players follow a storyline and a series of mini-games while learning how viruses invade host cells, the basic biological mechanisms associated with infection, and how human cells detect viruses. 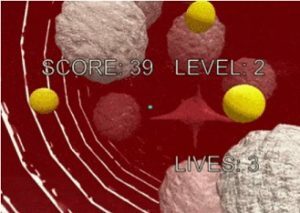 As the game begins, the immersive technology casts the player in the role of the virus, determined to avoid the predatory white blood cells and find a juicy red blood cell to infect. One of the Vir-ed mini-games follows a similar format to the memory game Simon. Players must remember the sequence of a ribonucleic acid (RNA) nucleotide, which consists of the nitrogenous bases adenine, guanine, cytosine, and uracil (AGCU). To complete the mini-game, the player must remember a random assembly of three to six nitrogenous bases with the ultimate goal of getting the order right for a total of 21 cumulative nucleotides. To develop the software for the game, the Pitt team worked with a nonprofit called Cacti Council—an educational organization that uses computer science to promote critical and creative thinking. A total of 17 people from the Cacti Council team worked on Vir-ed, including graphic designers, programmers, recording artists, and user experience (UX) designers. Vir-ed is already available on the Google Play Store and can be downloaded and viewed on an Android phone and any VR headset. Dr. Shoemaker and Mr. Gregg have almost finished adapting the game for Apple devices, and they are considering adding new features like augmented reality in the future. “The immediate next step will be to work with the school’s Engineering Education Resource Center to introduce the game to middle and high school students and get feedback on how it performs as an educational tool,” says Dr. Shoemaker. “Based on what we’ve seen so far, we expect positive response,” adds Mr. Blanchard. Dr. Shoemaker leads the Shoemaker Immunosystems Lab at Pitt. He and his team of researchers use mathematical models and simulations to better understand immunity and health. By applying the engineering knowledge of the immune system gathered from these models, the team can develop new therapies to promote improved patient outcomes, patient-specific treatment, and immune optimization.